If you’re going to do something as ridiculous with your life as play a hundred Test matches, you would want to mark that milestone with a hundred runs. When you think about it, that’s over 400 days standing around under various shades of baking sun, with the occasional vest-huddling Arctic breeze to mix things up, being yelled at by masses of drunk human idiocy or ignored by the depressing expanses of empty stands. Over 400 days of chasing leather, crouching and cramping, walking in with the bowler, running back with the flight, sweating and toiling and aching, before being pounded with missiles once again, and as often as not, returning to a tomblike dressing room without a decent score against your name. Those are the easy bits, before we start talking about being a bowler. Of the 64 men who’ve had the fortitude to reach the 100-Test mark, Colin Cowdrey, Javed Miandad, Gordon Greenidge, Alec Stewart, Inzamam-ul-Haq, Ricky Ponting and Graeme Smith saluted with the bat while doing it. All of those players have more centuries than Brendon McCullum, so it wasn’t entirely reasonable to expect that he would match their feat. Part of the hype about hundreds is that you can’t just rock up at the quartermaster’s store and put in a request. But in his landmark Test, with a Wellington crowd behind him and a farewell Test ahead, there was always the idea that McCullum might do something special. His only Test century against Australia was scored at this ground in 2010, and his triple-century against India two summers past. In the end, McCullum’s tally for the match did involve the numbers 1, 0 and 0. Unfortunately for him, the chronological ordering read 0 and 10. Twice the ball jagged into him, once taking the edge on its way to pad and cordon, the other fuller and trapping him in front during the last over of day three. Failure against Australia is not new for McCullum. In Tests, his average of 38.07 drops to 24.59 against owners of a baggy green. He has passed 50 only four times in those games, once every 7.00 innings versus a career rate of 4.14. Not only that, but all those scores were made in his second innings in games that were well and truly lost. His ton only delayed a ten-wicket loss. In One-Day Internationals, the difference is less stark: 30.41 average overall, 28.76 against Australia. Only in 20-over cricket, with the small sample size of five innings, does his record improve, on the back of the unbeaten 116 he scored at his last attempt in 2010. Against Australia, he averages 57 with a strike rate of 156, versus an overall rate of 35.66 at 136. 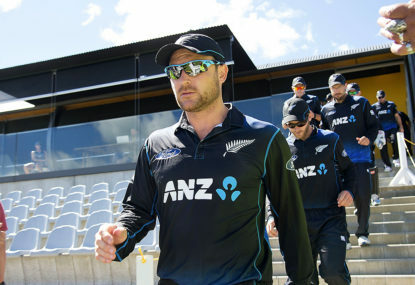 But of course, McCullum will not be able to add to those five innings at the upcoming World Twenty20, where New Zealand could contribute to knocking out Australia in the group stages. He won’t be there, retiring from all forms after his next Test. It’s a decision that makes no sense. McCullum made his name and changed his trade on the back of his T20 game. The disappointment of losing that 50-over World Cup final less than a year ago must rankle, and New Zealand are a genuine chance in the shortest form. McCullum remains one of the most destructive batsmen in the world, with a global carnival of destructive batting to start a fortnight after the Christchurch Test. And yet, that is where he’s decided to call it quits, facing the side against whom his record is worse than any other. It fits with a feeling about the man and his career: a vague feeling of unfinished business. In ten miracle months through 2014, he fell five runs short of matching Michael Clarke’s feat of four double-centuries in a year. His 195 would have been the fastest double in history if he hadn’t holed out trying to reach it. Of his 11 centuries, one was a triple, two were doubles and two more were above 185. But to register scores so big and still average under 40 tells a story. He’s shown what he could do, it’s just that mostly he didn’t. He’s had 174 Test innings but made nearly a fifth of his runs in five of them. Two of his 12 calendar years of Test cricket returned averages over 40. It was either curious or telling that Cricinfo’s list of his five great knocks included 97 in a rained-out draw and that 104 against Australia in a flogging. More important though than McCullum’s individual struggle has been the way his team has folded, faltered, and grown timid against their brasher trans-Tasman rivals. New Zealand’s wave of adrenaline through to the 2015 World Cup final broke meekly on the Port Phillip shore as they reached Melbourne. They were talked up before the November 2015 Test series, but failed to arrive until its sixth day. They had a Test win and a series draw for the taking in Adelaide, but couldn’t keep their heads after an umpiring error. In Wellington, they did exactly the same, having already slipped as favourites with a first-innings collapse. McCullum has been feted as a leader and inspirer, and deservedly so. He has made this team as good as it is, and won the respect of many. But alongside the respect and even adoration is a frustration for the sporadic nature of his batting achievements. With one Test to play in that career, he cannot change his ilk or his approach. But his team desperately needs McCullum’s dice to land the right way on his last roll.